CHASING FOOD DREAMS: Morganfield’s: Presenting The Iberico Baby Back Rib! Morganfield’s: Presenting The Iberico Baby Back Rib! The Iberico Oink Arrives at the Home of the Sticky Bones! Mention ribs and I am thrilled, mention baby back pork ribs and I am ecstatic, mentioned Iberico baby back pork ribs and my heart may miss a few beats. Jumping on the bandwagon of the Iberico fame, Morganfield’s, Home of the Sticky Bones is proud to present their latest menu of succulent Spanish Iberico Baby Back Ribs. Morganfield’s is not called the home of the sticky bones for no reason. Serving up their signatures of ribs, carnivores will be delighted at the varieties of ribs and racks available at all Morganfield’s outlets together with other dishes. There are currently five outlets with three in city here and two in Penang. The restaurant runs on the concept of American casual dining with a Southern hospitality charm. Combining the best of soul food and music, Morganfield’s is set to please hungry carnivores with their signature ‘Sticky Bones’ and great music. Morganfield’s goes smart comfort in their interiors, making full use of wood, bricks, warm lightings and unfinished touches with lots of groovy posters. Different sections of each outlet set different moods and there are plenty of big and small tables to cater to everyone. As they always say, great food is meant to be shared so Morganfield’s is perfect for big groups of dining. Iberico, the famed Iberian black pig is native to the Iberian Penisula (Portugal and Spain).It’s rise in recent gastronomic industry is due to its remarkable flavours from its dark and beautifully marble meat that is lusciously tender. Morganfield’s import all their Iberico baby back ribs from Spain. A bunch of foodies met at Morganfield’s largest outlet at eCurve a few weeks back for a taste of Iberico baby back ribs. As soon as we arrive, we ordered our chilled and blended coolers, a signature of the restaurant. Seen here are Berry Easy, Mango & Lime Lassi, Begonia and Cucumber, Apple & Mint Spritz. I managed to taste all four and let me tell you, these are super refreshing and absolutely delish. Besides these, the restaurant has a long list of other beverages with plenty of giggle juices. The appetizer list is pretty much attractive and pays homage to the American favorites with an European twist like Pork Sausage Platter, Bacon Wrapped Meat Balls, Chili Cheese Nachos, Spicy Chicken Wings, Russet Potato Skins and more. We had the Onion Blossom (RM14.90), a blooming bouquet of a large white onion breaded, deep fried and served with BBQ mayo. The onion is thoroughly enjoyable as we picked on each petal of sweet soft and crispy onion, every petal beautifully golden and light. I couldn’t get enough of this and had to stop myself since it was only the starter of the night. Then we dived head on to a sea of ribs, from beef to lamb to pork. Making a glamorous entrance is the new Iberico baby back ribs that come with two different marinades. Go Jack Daniels Glazed Iberico Baby Back (RM49.90 per slab) or Jim Beam BBQ Iberico Baby Back (RM49.90 per slab), both comes with coleslaw and French Fries or Onion Rings. The Jack Daniels Glazed Iberico Baby Back is sweeter and oozed with deep richness of caramelized flavours. I loved these ribs a lot. It is certainly the king of all glazes as the balance of savory with good dose of rich sweetness will have everyone sucking the ribs happily. The Jim Beam BBQ Iberico Baby Back is also pretty good with less sweetness than the previous one. This one has a light tangy note and is smothered in lots of BBQ sauce. The ribs are succulent, tender and definitely very moreish as it has fully taken on the marinades throughout the cooking process. After tasting this again, I am reminded why I would pay for the premium Spanish black pig. Next up, Lamb Rack Ribs in Garlicky BBQ (RM54.90 per slab) showcase trimmed lamb rack ribs slow cooked for hours before completed on the hot grill with your choice of sauces of Hickory BBQ, Garlicky BBQ, Smoked Peppercorn, Spicy Asian BBQ and Plain & Served with Mint Sauce. The lamb ribs are so tender and moist. It’s well-trimmed till pretty lean and an order gets you four thick rack ribs served with red skin mashed potatoes and vegetables. Kudos to the house made red skin mashed potatoes as it can only mean that this is made with the real McCoy spud and not some powder stuff. The Garlicky BBQ sauce paired so well with the lamb. I prefer this Lamb Rack Ribs over the coming Beef Ribs. Both ribs are also imported for better quality. Then came huge chunk of Beef Ribs (RM54.90 per slab) served with French Fries and Coleslaw. Choose your choice of sauce for the ribs. We had the Hickory BBQ sauce on the beef ribs. Though the Beef Ribs is well cooked and the sauce is delicious, I just seemed to prefer the pork and lamb ribs. The beef ribs didn’t take on the flavour component as well as the other pork and lamb ribs. Plus point, this one has loads of meat for big eaters. Morganfield’s also has three types of ribs sampler meant for sharing. Now I knew these are huge platters but when it arrive, I was still pretty stoke at its gargantuan portion of the Ribs Sampler (RM179.90), which consisted of three ½ slab of Spare Ribs with your choice of sauce, Grilled Footlong Farmer’s Bratwurst Sausage, Grilled Thuringer Sausage, Grilled Hungarian Sausage, Garden Salad, Grilled Corn on the Cob, Corn Bread and French Fries. These will feed 3 to 4 hungry diners or more than 4 small eaters. We had the Spicy Asian BBQ Spare Ribs, Garlicky BBQ Spare Ribs and Smoked Peppercorn Spare Ribs. These are the original signatures of Morganfield’s. Its meaty, its tender, its well-cooked and flavoured. I had a great time enjoying these ribs despite me being full. My favorite sauce has to be the Garlicky BBQ because of its robust garlicky and sweet notes. The Asian Spicy BBQ is pretty good to as it is catered to those who love heat flavours. All three sausages are very good and everyone agreed that evening. We also really enjoyed the corn bread for its light and fluffy texture and flavours. The other two platters are The Carnivore (RM139.90) and Ocean Madness (RM159.90) offering a mix of Spare Ribs and Sausages with Poultry or Seafood. Besides ribs, there are also Steaks & Chops, Seafood, Poultry, Glam Burgers, Sandwich, Tacos and Dessert. Dinner that evening was pretty satisfying! It’s been awhile since I had ribs and these are delicious. I do like the vibe at Morganfield’s as it certainly has the best combination of great ribs and music. Get rewarded with FREE Onion Blossom eCoupon! 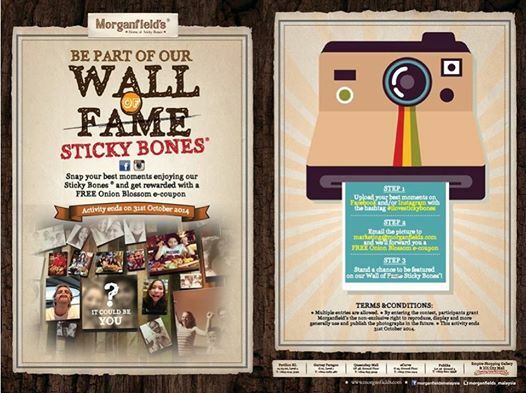 Participate in Morganfield’s "Be Part of our Wall of Sticky Bones®" activity! Simply submit you best moments on Facebook or Instagram with hashtag #ilovestickybones and email the photo to the email in the photo. T&C applies. Love your photos Jen! You always shoot some of the best food photos! Last time I came here, I never noticed that they do the onion blossom. I really love this, and been a while since I found a good one in KL. Need to head over for that and of cos some ribs! All new and expectant mothers are certainly aware that babies are wonderful and fun little bundles of joy. These little angels also cost a great deal of money when it comes to purchasingkids and baby product reviews food, baby formulas, and baby diapers. The cost of all of these products is going up almost daily it seems. You want your baby to have what it needs and you do not want to sacrifice quality for quantity. The question is how to buy your baby products like diapers and formula, and still stay on a reasonable budget. Luckily, there are ways to do this and you can start saving money today on your next purchase of baby food, formula, or diapers.